Humphreys Signs Digital Department consists of two HP Scitex FB500, large format flatbed printers alongside two HP Latex 360 Roll to Roll Printers,. 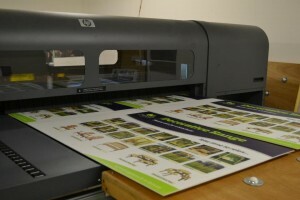 Throw in an Epson 9880, Mimaki JV33, Rolls RollX Applicator, and a state-of-the-art Zund Cutting machine and you can see that we are geared up to cope with most signage requirements. Our policy of ongoing investment in technology has assured the best quality signs with improved productivity in order to handle the increasing number of customers who rely on us to regularly supply their signage . This also illustrates our commitment to innovation, and dedication to the protection of the environment by using less harmful inks and quicker, more efficient equipment. What is UV Flatbed Printing? Flatbed Printing (UV) is the Greener choice for creating digital signage printed directly onto to a host of substrates without the need for harmful materials such as solvent based inks, thinners, and emulsions. Unlike water-based and solvent-based inks, there is no evaporative component to the UV inks used in Flatbed Printing but when exposed to sufficient UV-wavelength energy, a catalytic reaction occurs that causes the ink molecules to bind together. This binding is referred to technically as “cross linking” or more commonly as “curing”. Using the latest UV Flatbed Printing technology we can produce a huge range of Signs, and advertising products at exceptional quality. Our rigid graphics include Foam Board, Aluminium Composite, and Correx. We print onto these using our large flatbed printer which makes light work of almost any rigid material.